Glen Bull is a professor of STEM Education in the Curry School of Education at the University of Virginia, and principal investigator for the Laboratory School for Advanced Manufacturing initiative. Hossein Haj-Hariri is a co-P.I. and chair of the University’s Department of Mechanical and Aerospace Engineering. Abrianna Nelson is the Lab School Liaison at the University of Virginia. Despite the billions invested in educational technologies in schools each year, few controlled research studies can document scalable gains in learning. New technologies do not automatically translate into improved learning. Desktop 3D printers have now become affordable enough to place in schools, which are acquiring them by the thousands, facilitated by crowd-sourced initiatives such as Donors Choose and Kickstarter. What Lipson was asking is: How can emergent technologies be deployed to create new opportunities for effective and engaging learning in schools? As professors and faculty at the University of Virginia, we responded, collaborating with local schools to establish a K-12 Design Laboratory. 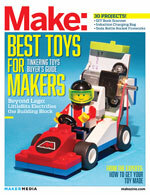 It was to be a test bed for developing curricula based on digital fabrication, including 3D printing. A Lab School student examines a 3D print in progress. The promising results led to a joint venture between the Charlottesville and Albemarle school systems and the University of Virginia, established with support from grants from the National Science Foundation, the Commonwealth of Virginia, and local government. 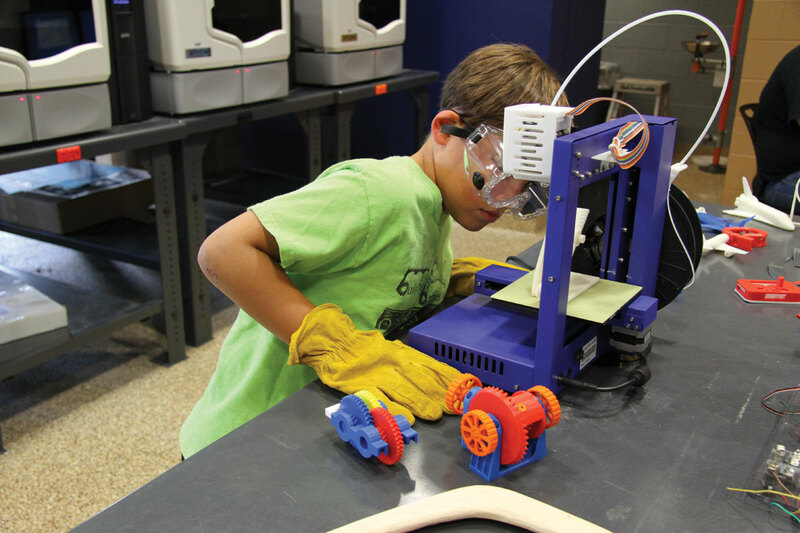 Two middle school sites, the Buford Engineering Design Academy and the Sutherland Engineering Design Academy, were launched at the beginning of the 2013-2014 school year. A glimpse of a Lab School classroom reveals students working on projects in small groups, with 3D printers arrayed along the walls — one for every four students. Other fabrication technologies, such as computer-controlled die cutters, drawers of microelectronic components, sensors, motors and actuators, soldering stations, hand tools, and even laser cutters and CNC machines are readily available. Student projects are open-ended to incorporate engineering design into science teaching. 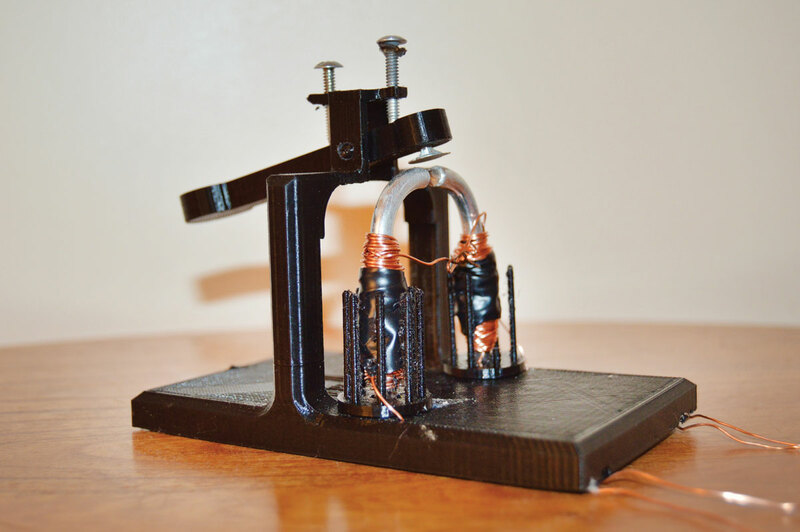 Lab School students used 3D printing to reconstruct the Morse-Vail telegraph relay. It was here, with the help of curators from the Smithsonian’s National Museum of American History, that two Lab School students, Jenn and Nate, reconstructed the Morse-Vail telegraph and relay. They used Alfred Vail’s 1845 description of the device to design a modern version using digital fabrication technologies. The work of makers such as Samuel Morse, Benjamin Franklin, Joseph Henry, and Alexander Graham Bell illuminates the process of invention and innovation. Their seminal discoveries are more accessible and easier for novices to understand than many modern techniques. The functions of the electromechanical systems of this era have tangible components that can be deconstructed and understood. During the initial years of the U.S. patent office, submission of a working model as a proof-of-concept was required for a patent. A selection of these patent models are now housed in the Smithsonian. Patent model of the 1854 Page motor, US Patent #10480. So the Smithsonian is collaborating with the Lab School to digitize key inventions for young makers like Jenn and Nate to reverse engineer. The Smithsonian’s 3D explorer (http://3d.si.edu) allows students to measure every angle and even analyze cross sections of objects. 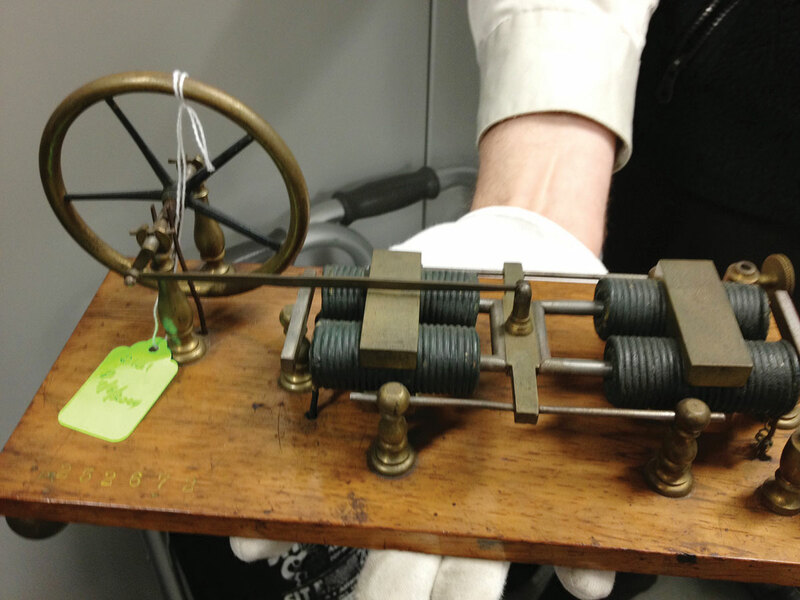 As the Lab School inventions — from the telegraph to Charles Page’s early electric motor and more — get digitized, the site will provide 3D files and supporting materials to help other schools replicate the process. The goal is not an exact physical replica, but a reinterpretation of the device using modern manufacturing technology. The three-dimensional scans of the artifacts are inspiration for the students’ own designs, allowing them to create a product that is uniquely their own. The reconstruction helped Jenn and Nate understand the relationship between science and engineering. They applied the principles they learned in science class to the design of the telegraphic relay to determine how much current in the primary coil was needed to activate the secondary circuit. They enjoyed the process of scientific exploration and discovery. They learned, contrary to what they thought, that there are many things scientists do not know or understand. They saw that Vail and Morse experienced problems parallel to their own, both in science and engineering. In science: Neither the scientists (in 1840) nor the students (in 2014) fully understood the properties of electricity. 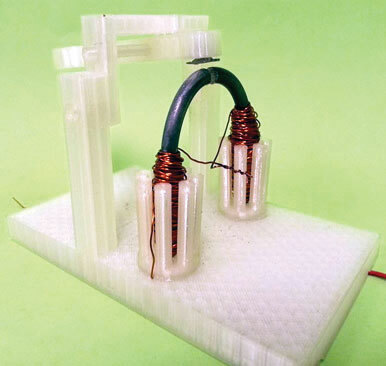 In engineering: Both the inventors and the students had difficulty fabricating a reliable relay with a three-point connection. 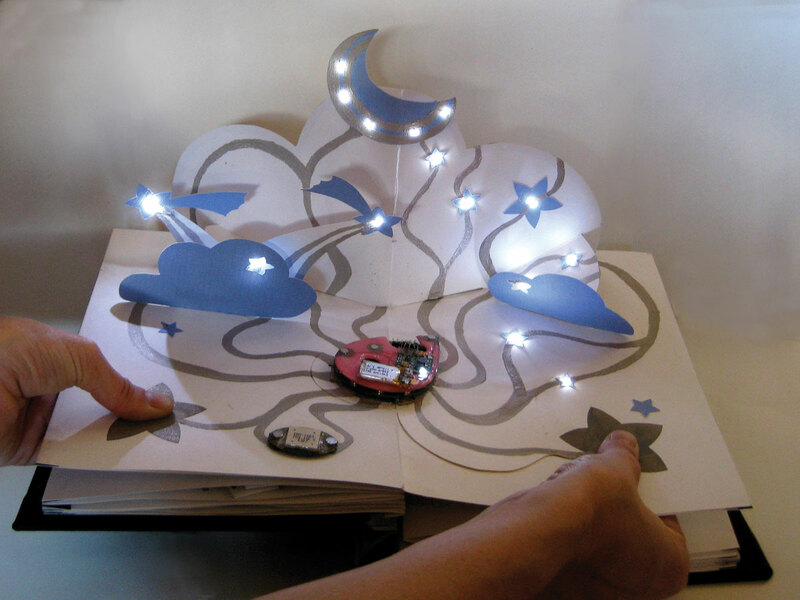 An example of artwork created with circuit stickers. A pilot cadre of students from the Laboratory School participated in an Engineering Design Academy this summer. The student engineers learned about telegraphic relays, solenoid engines, and linear motors. Teams were challenged to design and fabricate an electromechanical tone sequencer capable of playing a tune, and the students combined the relays, solenoids, and linear motors to create an electromechanical sequencer that reproduced the chimes of London’s Big Ben, and presented their invention at the Smithsonian. In the future, exemplary inventions will be showcased in a Museum of Electronic and Moveable Objects in each school. This work with electromechanical inventions serves as a springboard for inventions that incorporate modern technologies. For example, an interactive mural is being designed for each school that will incorporate circuit stickers — peel and stick electronics for crafting circuits — to recreate the students’ electromechanical music machine. The Lab School has already affected the educational directions of at least two students: Jenn has decided to become a biomedical engineer, and Nate has chosen to focus on mechanical engineering. However, the point is not that all students should select careers in engineering; the goal is to ensure all students can explore desktop fabrication technologies. Like any other tools, they can be applied in myriad ways that enrich children’s lives and make learning more engaging. As the Lab Schools enter their second year, advanced manufacturing technologies are being incorporated throughout the physical science curriculum. Students are creating their own inventions, and sharing their work through FabNet, a network of schools collaborating to co-construct new ways of teaching and learning in this shared space.